The Copper Chimney is nearly empty as we walk through its homely glass paned door. Decorated with the modest trappings of a 70's era family restaurant, the place likely won't win any awards for its decor. Still, the muted interior is as clean as the crisp white tablecloths; the single dining room is spacious and the tables are well laid out. We are greeted enthusiastically and led to our reserved spot, which looks a little sad tonight surrounded by empty tables. We order some beers -- the selection is small but includes several local brews, including Mill Street Tankhouse -- and order a starter, the Garlic Vegetable Balls ($5.95). The appetizer arrives as a platter of six large balls slathered in a tomato-garlic sauce, plated on a bed of shredded cabbage. A crispy exterior belies a surprisingly dense core for a vegetarian dish. Rather then the falafel-like texture I was expecting, the balls are viscous and starchy inside, looking and tasting like an Eastern European dumpling. I can't quite tell which vegetables actually compose the balls but each orb somehow tastes like a boneless buffalo wing. The dish is a curious, pleasant surprise. The entrées arrive simultaneously and in short order, served in handsome metal bowls. 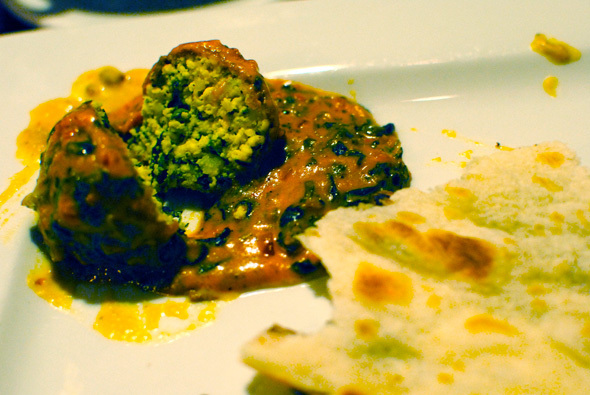 The Saag Paneer ($10.95) is delightfully rich. Spinach puree lightens the sweet, creamy dish. Sharp tasting balls of paneer crumble without disintegrating when attacked, an impressively light texture for a ball of cheese. 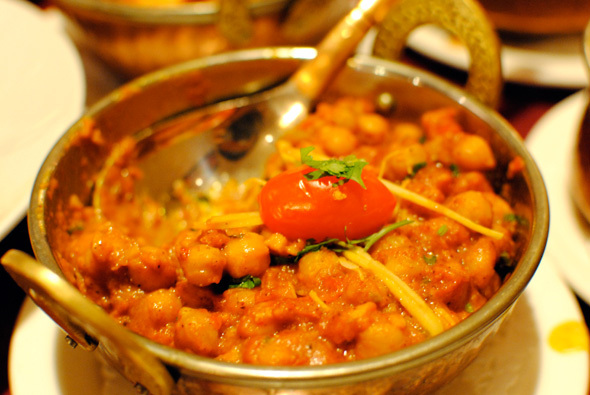 Our Chana Masala ($8.95) is a generous portion of chickpeas, each slightly firm to the bite while tender and flavourful inside. Fresh julienned ginger serves as more than just garnish, balancing the sweet zest of the dish's fresh tomato sauce. 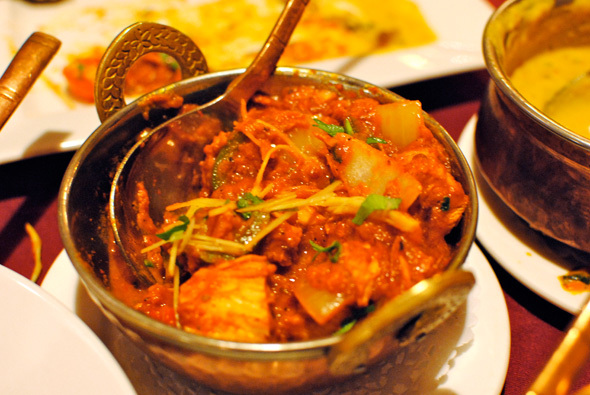 Moving on to our meatier fare, the Kadai Chicken ($11.95) is yet another hit. White meat chicken cubes are simmered with green chilies, onions, tomatoes, red peppers and ginger. Expecting a fair amount of spice, I'm a bit surprised at how mildly the chilies infuse the dish -- there's definitely a kick but my heat meter barely registers. The chicken is moist, tender and quickly scooped up by my companions. Finally, the Lamb Pasanda ($11.95) reveals perhaps the only hiccup of the night, a delicious combination of saffron and cashew purée. The nuts provide a velvety texture to the sauce while the saffron, as expected, produces a subtle punch of aromatic sweetness. The lamb however seems a bit tough; the meat is either too lean or very slightly overcooked - perhaps a bit of both. Still, this is splitting hairs. 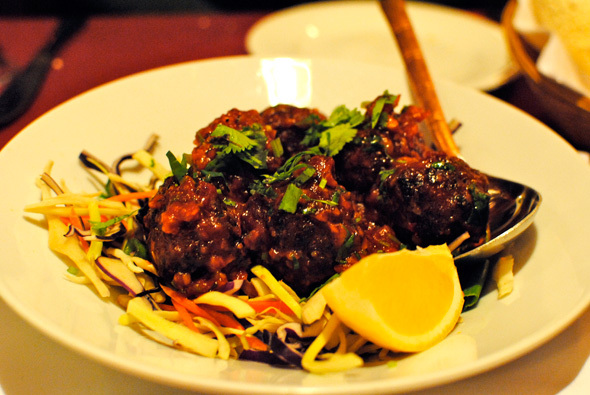 Some slightly stringy lamb doesn't detract from the gorgeous, subtly gamey dish. We order some plain naan ($1.95) and one bowl of long grain basmati rice ($3.50) to soak up our mains. The naan is, to put it succinctly, perfect. Served piping hot with the gentle elasticity of fresh bread, the naan has just the right density to compliment our hearty entrées without falling apart. The rice is served in huge bowl, fluffy and garnished with saffron. We want dessert but are too full to even consider it. 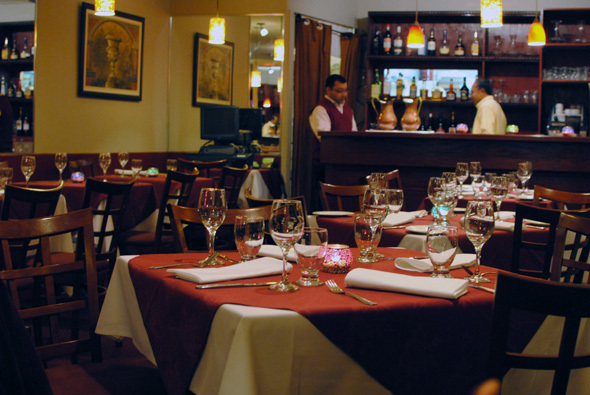 Of particular note about the predominantly Northern Indian cuisine at The Copper Chimney is how fresh and clean the ingredients all seem. Even when cool, none of our food turns into gelatinous clumps, nor do pools of grease float atop our entrees. By the time we leave there is only one other table dining in and perhaps two or three take orders have been filled over the course of our meal. This seems like a travesty as we rave about our satisfying and slightly gluttonous meal. 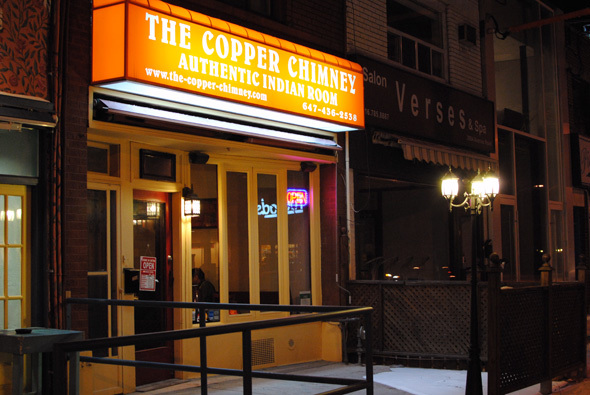 Located in a stretch of North York where good eats have historically been scarce, I'm hoping the exceptional food and reasonable prices of The Copper Chimney become a long-lasting staple in Toronto's catalogue of Indian options .